While top professionals do lose big games now and again, it seems a bit unusual for so many to be struggling at the same time. In the past few weeks, Korean pro Lee Sedol 9P has lost a few important games he was expected to win, and Lee Changho 9P has been in a painful slump. Now, it looks possible that things could get rocky for a few Chinese players as well. Kong Jie 9P, Chang Hao 9P, and Nie Weiping 9P were all eliminated in the first round of the 3rd Quzhou-Lanke Cup, which ended this Wednesday. 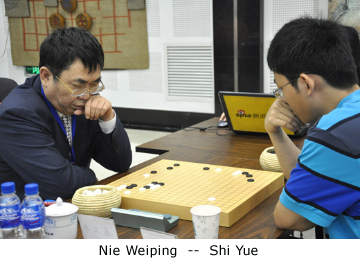 Nie Weiping’s loss to Shi Yue 4P was not too surprising, as Shi Yue is one of China’s better mid-level pros and may move to the top level in the future. Chang Hao lost to Li Zhe 6P, a mid-level pro, who has played very competitively against Kong Jie, Gu Li 9P, Chang Ho, Lee Sedol, and other top players. The big surprise in the first round came when Jiang Weijie 5P defeated Kong Jie. Jiang Weijie turned pro in 2005 and is a solid player, but has yet to win a major tournament. 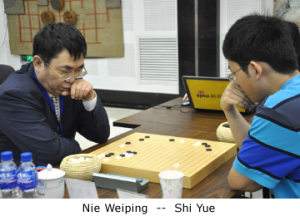 Gu Li, the defending Quzhuo-Lanke Cup champion, was the only top Chinese pro to make it out of the first round, defeating Zhong Weijing 5P by resignation.